Sound of gunfire continued to ring around the security directorate area in central Port Said into the early hours of Sunday night as several media outlets reported that police and army soldiers have been exchanging fire at the end of a tense day in the Suez Canal city. However, Egyptian armed forces official spokesperson, Colonel Ahmed Ali, issued a statement on his Facebook page on Sunday night denying reports that army units in Port Said clashed with police forces. "It is completely untrue that armed forces units in Port Said exchanged fired with police forces during the clashes," Ali wrote adding that the presence of the army units at the governorate buildings was intended to secure the premises and to attempt to end the clashes between the protesters and the police. According to the official statement, an army colonel responsible for the army unit at the governorate building was shot in the leg and a Central Security Forces (CSF) conscript was killed by a bullet by uknown assailants. 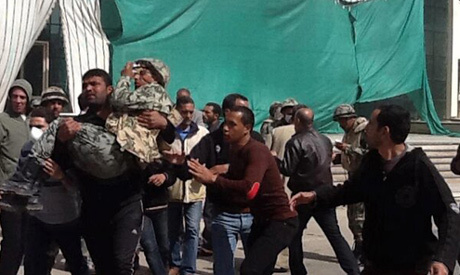 The army colonel was transferred to Port Said military hopsital. Meanwhile, the ministry of health, which has been documenting casualties' toll throughout the day, said that five people were killed during the incidents. The ministry also reported that at least 39 other people were injured by gunshots throughout the day including 7 army and CSF personnel. During the day, over 500 people were injured in clashes between police and protesters near the security directorate, according to the health ministry. The ministry of health said at least 260 of the injured protesters suffered teargas inhalation during the clashes. Civilians could be seen around the area aiding army soldiers, many of whom suffered from teargas inhalation. Police had fired intense rounds of teargas canisters throughout the day at demonstrators who were opposed to a decision by the interior ministry to transfer 39 prisoners charged with involvement in last year's Port Said stadium disaster from the Suez canal city to Wadi Natroun jail in Egypt's Beheira governorate. Twenty-year-old Ibrahim Shoman suffered serious eye injuries after being hit with shrapnel. Thousands of Port Said residents have been conducting a campaign of civil disobedience in the past two weeks to protest policies of marginalisation at the hands of the central government and to demand justice for more than 40 protesters killed in clashes with the police on 26 January. Dream on. Morsi has broad support. Condolences to those killed and injured. God/Allah bless the people of Port Said, they are and have always been heroes fighting against injustice and invasion, first from enemies outside of our borders, now from within. The CSF would do well to remember the chant during Jan 2011 'the Army and the people are one hand'! God/Allah, save us all, we are surely in great need of your intervention! Four killed ad 400 injured ,congratulation Mr Morsi you done vey well but do not forget where is Mr Mubarak now. Egyptians are burning their own backyard. What a shame ? Soon you'l be like Darfur or Mogadishu or may be Syria.